Aunt Jemima, Uncle Ben, And Rastus: Blacks in Advertising, Yesterday, Today, and Tomorrow provides a mirror to our past—a past that has been ignored or overshadowed for too long. Marilyn Kern-Foxworth chronicles the stereotypical portrayals of Blacks in advertising from the turn of the century to the present. Beginning with slave advertisements, Kern-Foxworth discusses how slavery led naturally to the stereotypes found in early advertisements. From the end of the slave era to the culmination of the Civil Rights movement, advertising portrayed Blacks as Aunt Jemimas, Uncle Bens, and Rastuses, and the author explores the psychological impact of these portrayals. With the advent of the Civil Rights movement, organizations such as Congress of Racial Equality (CORE) and National Association for the Advancement of Colored People (NAACP) voiced their opposition and became active in the elimination of such advertising. 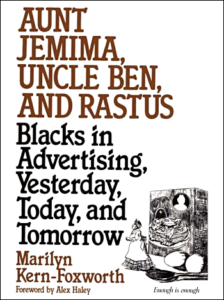 In the final chapters, Aunt Jemima, Uncle Ben, And Rastus examines the reactions of consumers to integrated advertising and the current role of Blacks in advertising. Its truly novel subject matter and its inclusion of vintage and contemporary advertisements featuring Blacks make this a valuable work. Marilyn Kern-Foxworth is Associate Professor in the Department of Journalism at Texas A&M University. In 1994, she was the Garth C. Reeves Endowed Chair at Florida A&M University, Department of Journalism, Media and Graphic Arts. In 1981, she received a Kizzy Award from the Black Women Hall of Fame Foundation. On September 29, 1967, I stood on a dock in Annapolis, Maryland, where my great-great-great-great-grandfather had been taken ashore two hundred years earlier on September 29, 1767. It was one of the moments when I truly realized the importance of knowing one’s history and the importance of documenting every facet of that history. Because for a long period of time it was against the law to teach slaves to read and write, much of black American history had to be documented by people other than blacks. As a result, much of our history has either been lost or severely distorted. Now that we have moved into a new era, there are many more opportunities for black Americans, and more and more books have been written that document the black experience. I am proud to say this is one of those books which offers a collection of information that is long overdue and chronicles the history of blacks in a critical area that has been previously under-recorded—advertising. I am aware that Dr. Kern-Foxworth has been researching this topic for years, and her diligence has paid off in the thoroughness of this book. All of the relevant areas are covered, and for those who still have questions, she has listed people and organizations which can assist in finding answers to those questions. Appropriately, the book begins with slavery, which played a key role in the shaping of black America. Dr. Kern-Foxworth demonstrates graphically some of the psychological problems deeply embedded within the black community that descend from slavery. This book is timely because African-Americans have begun to reexamine, investigate, analyze, and scrutinize their heritage more now than ever before. We have ceased shunning our past and are dedicating more time to understanding why and how slavery, Jim Crow, prejudice, discrimination, and bigotry became a part of the American way of life. As I travel from city to city in America, I see and hear people inquisitive about their “roots.” I am asked by Americans of African descent about their heritage, legacies, and genealogy. I talk with black people who have acquired a greater appreciation for black artifacts and memorabilia, which is why there has been such a proliferation of interest in black collectibles, even those that are grotesque, demeaning, and denigrating to black Americans. This book provides a mirror of our past—a past that has been ignored or overshadowed for too long. ~ Alex Haley.